I’ve been growing chaya for multiple years now and it’s become one of our trustiest vegetables. 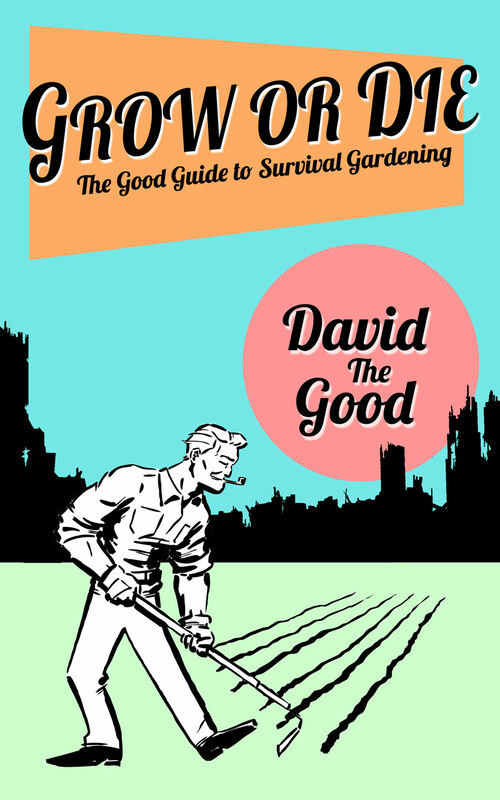 There’s a reason it features prominently in my book Totally Crazy Easy Florida Gardening. By the way, you can now find multiple varieties of chaya for sale on ebay. There seem to be two main varieties. The jury is out on whether they’re different species or just variations on the same species. The deeply-lobed type appears to be a wilder form and the maple-leaf type seems to me to have been better selected as a vegetable. There are stinging hairs on the leaves of the really wild types, but both of my cultivars don’t seem to have that issue, except for the occasional prickle you’ll feel when picking. Plant genius Craig Hepworth hooked me up with the maple-leaf type some years ago and I can’t remember at this point where I acquired the deeply-lobed variant. Here are my observations on both. Tends to bloom quickly and when still short (3-4′). 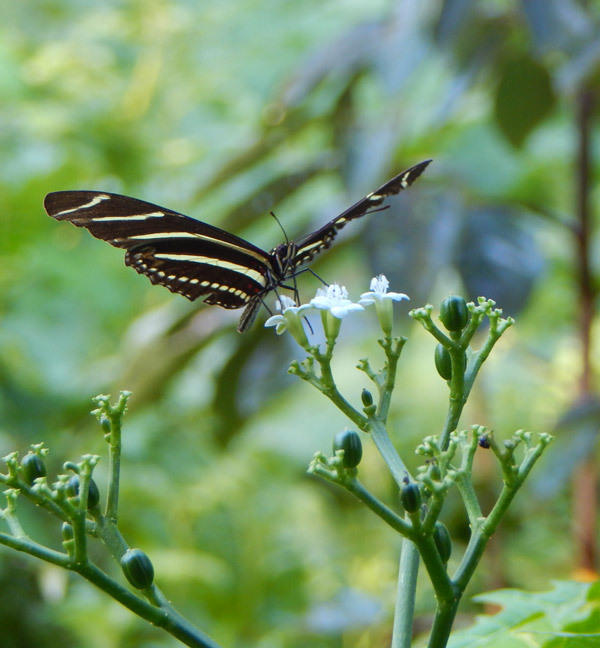 Plant both types of chaya and you’ll have leaves and butterflies. I’ve met people that bought the deeply lobed type as a “butterfly plant” without ever being told it was an edible vegetable. 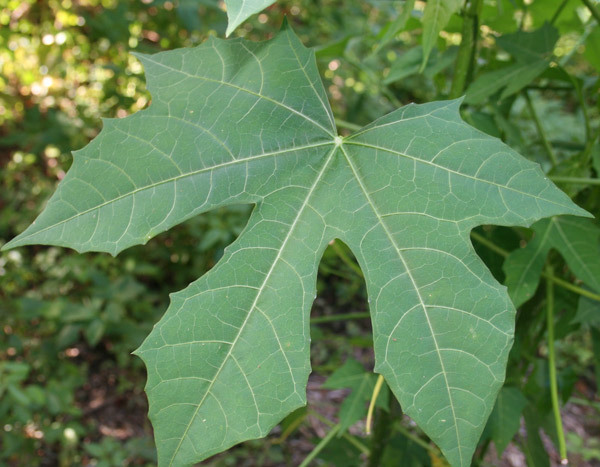 The leaves on both are good vegetables though I posit that the maple-leaf type edges out its deeply lobed competitor. 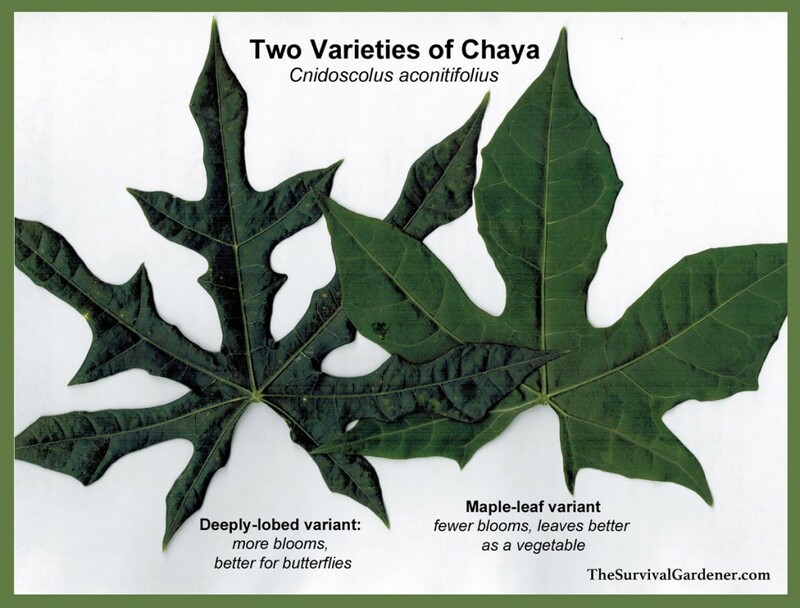 For my complete survival plant profile on chaya, click here. Definitely a must-grow if you have the right climate. My apologies to my readers north of zone 8. For a perennial green in your area, try growing Good King Henry or the always edible linden tree. 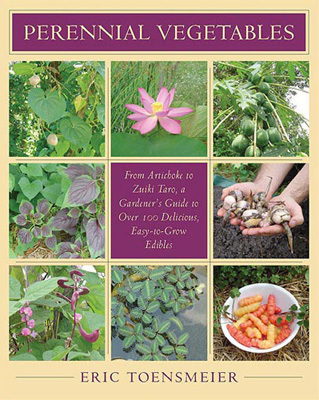 Even better, get a copy of Eric Toensmeier’s book Perennial Vegetables – wherever you live! 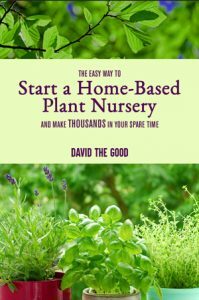 I keep coming back to that book and finding new perennial vegetables to try out. It’s interesting that you’re separating them by leaf shape. I prefer to do it by stalk. Though you might have different varieties than I do. There is the heavy lobe variety; with white speckled thin woody stalk. They do get very large, full size tree large. Than there is the “maple” leaf variety. I think of it as the edible stalked variety. If it has ample water it gets very think green tender stalks. They are very delicious! It doesn’t seem to grow as large or as vigorous. Neither of them have stinging hairs, but they are both amazing beautiful trees that are must haves. I have tons of the deeply lobed variety but I don’t have any of the maple leaf kind. Do you know where I can acquire some the maple leaf? I’m in FL in Brevard Co. and have never seen either kind in a nursery. I’ve always thought of chaya as being more of a pass-along plant rather than a nursery plant. There are cuttings for both varieties on e-bay. You can also find mulberry, pomegranate, katuk, figs, Okinawa and longevity spinach, Mexican sunflower, bocking 14 comfrey root along with many other useful plants that grow from cuttings easily. Sorry for sounding like an add. I was wondering what the difference is regarding taste and texture when cooking between the two varieties of chaya. I haven’t noticed much difference in taste, though the “maple-leaf” type seems to be more tender in texture. So, after I boil chaya what kind of seasoning or sauces could I put with it? I’m interested in one or two ingredient recipes. Spices? Vinegar? Bacon grease? Oh yeahhhhh…. My favorite is just to cook it in lightly salted water. However, my wife has put cooked chaya into lasagna, used it as a pasta replacement with spaghetti sauce, and added it to stirfries. Treating it like collards with bacon and a vinegar pepper sauce would be awesome. Thank you David. I really appreciate the ideas. You da best! I have the maple leaf variety if anyone would trade me the deeper lobed variety. I have the deeper lobed variety with speckled stems and flower easily. I live in Orlando but can mail it. Feel free to share this on the forums, too – I’ve set up a plant swap. 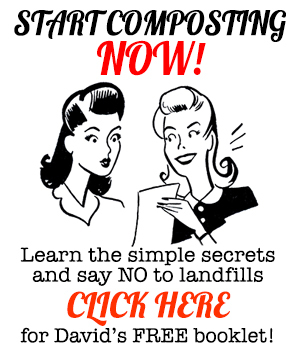 forums.thesurvivalgardener.com. I have tried to grow the deeper lobed variety in Oregon but it didn’t survive the winter cold. I grew the hairy variety in Hawaii with great success with tender stalks 1 1/2″ in diameter. The stinging hairs remind me of stinging nettles the natives used in the Pacific Northwest. If anyone could share this variety or the maple leaf variety so I can try them, I would appreciate it. My favorite recipe for Chaya is in quiche with different cheeses and spices. How long before the maple variety puts on significant growth? Had my plant in the ground about a year and still only about a foot tall. Is that about right? Thank you. No – it should be getting bigger faster than that. Usually after a few months they start to take off. Second year they grow very fast. How long do we have to cook the chaya in order for the toxins to evaporate? You mentioned stir frying? Dean Green from eat the Weeds says cook 10 to 20 minutes. I also am feeding them raw to my rabbits. Do you have any information on using chaya as animal fodder? I would love to use the leaves like kale and make baked chaya chips… Any one know if that works??? I usually cook them for ten minutes, but my wife does 20 just in case. They won’t turn into mush even then, so it’s a reasonable thing to do. Goats will eat chaya and I have heard they do it without ill effect. ECHO in Ft. Myers has lots of info. It might be worth writing/calling them to check. I’m not sure baking them would remove the toxins. That may take boiling. Calling from Ghana, west Africa. Thank you for the insightful information on the Mexican Chaya plant. Do you know anything about the African Chaya variety? Will be glad to get a feedback from you.